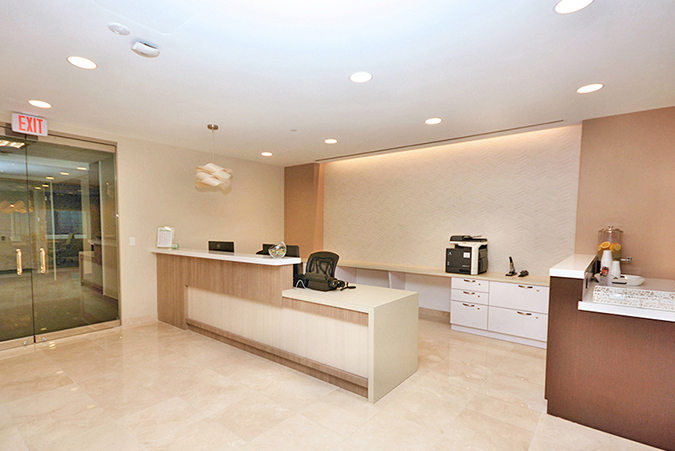 Welcome to our Miami Tower location at 100 SE 2nd St, Suite 2000, Miami, FL 33131. Our 11,406 square foot executive suite has 38 newly built-out window and interior offices to accommodate all your business desires and needs. With Premier Workspaces, you can experience the best of the Miami corporate atmosphere with one monthly invoice and no capital investment. An icon on the Miami-Dade skyline, Miami Tower is also the city's premier class A business address. Famous for its striking I.M. Pei design and an ever-changing exterior lighting scheme, the 47-story Miami Tower is also know for a world-class array of upscale amenities and Downtown’s most convenient office building. The Miami Tower is the most photographed building in the nighttime Miami skyline. Miami Tower is uniquely accessible, both inside and out. With internal connections to MetroMover station, James L. Knight Convention Center and Hyatt Regency Miami, being a pedestrian at the Miami Tower is a limiting factor. Outside, this iconic building represents the heart of Downtown Miami's central business district—with the most direct avenues to anywhere in the city as well as with first-on, first-off access to I-95. The city of Miami is known as the Gateway to the Americas and has a thriving cruise and cargo port. As a result, many national and multinational banks, law firms and financial institutions have made their home in this international commercial hotspot. The Miami Tower has a blue-chip list of satisfied tenants and would welcome providing your company with an upgraded image as well. When you choose to office in Miami Tower, you make an undeniable statement about the present and future of your company. 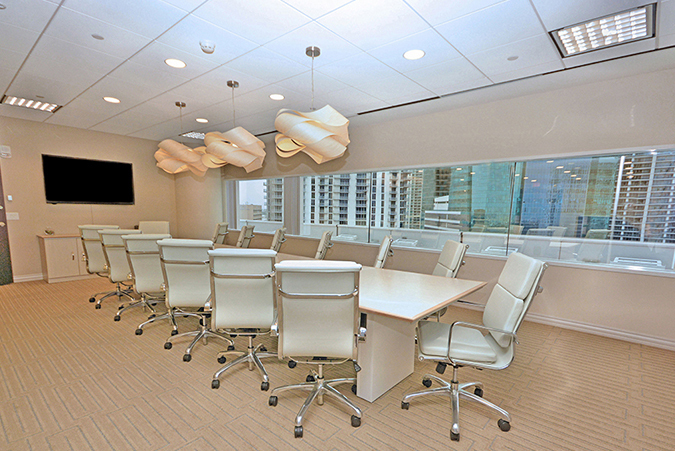 We offer flexible term Miami executive suites, including full-service office space, virtual office addresses, day offices, meeting room rentals, and much more. 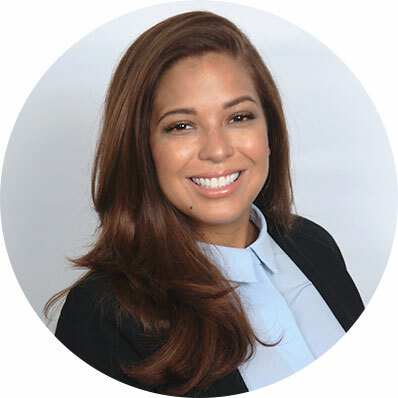 Not only can you obtain immediate occupancy, but we offer short-term agreements that allow you the flexibility to expand or cut back your business space on short notice; a choice not usually available in the conventional Miami office space market. 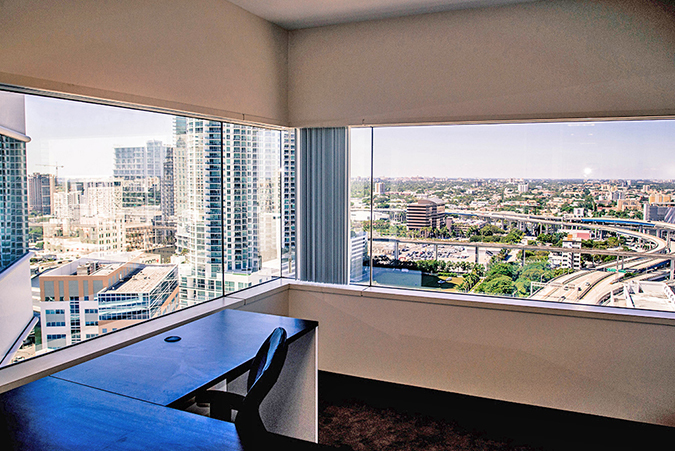 In addition to a furnished office space, PBC’s Miami Tower executive suite offers the tools you need to continue a successful business including; high-speed internet access, personalized telephone answering, mail service, voice mail, appointed conference rooms, secretarial services, a reception area, and a kitchen. Most of our 20th floor turn-key office suites offer spectacular views of Biscayne Bay, Downtown skyline, Brickell district, the new Marlins stadium and all of Miami-Dade. Our Miami virtual office plans are ideal for businesses that require a professional address and occasional use of a day office or meeting room. Clients have the opportunity to share a prestigious office space, without having to pay the full-time cost. Premier’s virtual office plans include most of the same benefits provided by a full-time agreement, including a friendly and professional administrative staff.